In the Rothbardian ideology of anarcho-capitalism, all law can supposedly be derived from contract, the entry into which is supposed to be voluntary. "Social contract" theories of government also tend, by this euphemism, to suggest that the formation of governments was somehow voluntary, an idiotic idea that anarchists such as the legal scholar Lysander Spooner have easily debunked. David Friedman justifies his neoclassical version of anarcho-capitalism by the Coase Theorem, which translated into legal terms is usually understood as the following: in the absence of transaction costs, and regardless of the prior allocation of legal rights, any tort ("externality" in economic terms) can be resolved by voluntary bargaining to form a contract, resulting in an economically efficient outcome. Consider two [legal protection] firms with somewhat different customer bases, bargaining over what court's legal system to agree on. Firm A prefers one legal system, say one that permits capital punishment for murder. Firm B prefers a different system, one that does not permit it. Each firm estimates the value to its customers, and from that the increase it can expect in its revenues, if it can provide them with its preferred legal system. We expect, along conventional Coaseian lines, that they will agree on the system that maximizes their combined benefit. [Source]. The proof that the Coase Theorem is false is actually quite simple: the assumptions of the Theorem contradict each other. The assumption that transactions are voluntary contradicts the assumption that any prior allocation of rights is possible, including rights that allow one party to coerce another. In fact, for the Theorem to at all make sense, a very large and crucial set of prior rights allocations must be excluded -- namely any that allow any party to coerce another. But we can't generally solve externalities problems by bargaining under this revised assumption. Externalities cannot be neatly distinguished from coercive acts, as extending one of Coase's own examples illustrates. In this example we have a railroad with a train that, passing by a farmer's wheat field, gives off sparks, which may start a fire in the field. In Coase's account, the prior allocation of rights might give the railroad the right to give off sparks, in which case the farmer must either plant his wheat far enough away from the railroad (wasting land) or buy the right to be free from sparks from the railroad. The prior allocation might instead already give the farmer the right to be completely free from sparks, in which case the railroad can either buy the right to emit sparks from the farmer or install spark-suppressors. If these are the two possible prior allocations of rights, Coase concluded that the railroad and the farmer will in the absence of transaction costs bargain to the most economically efficient outcome: if it costs less for the railroad to reduce the sparks than for the farmer to keep an unplanted firebreak, bargaining will achieve this outcome, and if the reverse, bargaining will achieve the reverse outcome, regardless of whether the farmer initially had the right to be free from sparks. So far, so good -- it seems, on the surface, that if bargaining is costless an efficient outcome will be achieved. The problem is that these are not the only prior allocations possible. The Coase Theorem is supposed to work under any other allocation of prior rights. But it doesn't. It fails for a large and crucially important class of prior allocations: namely any that allow one party to coerce another. Here's an allocation that may or may not allow coercion, depending on your definition of coercion: a prior allocation that gives the railroad the right to emit as many sparks as it wants. In particular it includes the right of the railroad to emit sparks even if it could costlessly avoid emitting them. Here's one that is fairly clearly coercive: the right to emit sparks even if emitting them costs the railroad something extra (i.e. giving the railroad the right to purposefully emit sparks to start fires even at some extra cost to the railroad). Here's another farther down the coercive spectrum: a prior allocation that gives the railroad the right to torch the farmer's entire field with a flamethrower. It is usually the case with coercion, as here, that it is far cheaper for the coercer to cause harm than for the victim to prevent it. To increase the threatened harm to the farmer, and thus the revenue it can obtain from extortive bargaining with the farmer, the railroad can spend extra to purposefully threaten the farmer. Here, it is likely far cheaper for the railroad to install a super spark emitter, or a flamethrower, than for the farmer to defend his fields from these sources. Indeed, since any prior allocation is possible, why stop with the farmer's fields? Another possible allocation would give the railroad a right to torch the farmer's barns, and his house, to kidnap his children -- any prior (ex ante) set of rules is supposed to be possible. In turn, if the ex ante rules allow, the farmer could threaten to tear up the railroad tracks or sabotage them to derail the trains. Under all these prior allocations of rights that allow coercion, the railroad need not just bargain to avoid the costs of supressing its externality (whether sparks or flamethrowers), nor need the farmer bargain just within this artificially voluntary spectrum of possibilities that Coase and his followers assume. Instead, if the ex ante rules so allow the railroad and farmer will bargain to avoid a negative-sum outcome: harm to the farmer with no direct benefit to the railroad, or vice versa. Since there are substantial ex post benefits to one party from extorting payments from the other, the party that can threaten the most harm at the least cost to itself has, if the ex ante rules allow, a strong economic incentive to engage in such coercion. These negative-sum games of coercion and extortion lead to highly inefficient outcomes, and they can only be avoided by carefully crafting the ex ante rules to avoid such coercion and extortion. These coercive threats that make negative-sum games possible, and that decrease the payoffs of positive-sum games, cannot be neatly distinguished in practice from innocent externalities: any act or omission of one party that harms another, i.e. any externality, doubles as a threat, whether a tiny threat or a large threat, from which an extortion premium, its size depending on the size of the threat, can be extracted. In order to try to distinguish coercion, and the extortion it gives rise to, from an "innocent" externality that can be cured by efficient bargaining, there are ways to exclude some of these extreme possibilities from the prior allocation of rights. And indeed criminal and tort law do this: they distinguish purposeful behavior from negligent, and negligent from the mere unfortunate accident. But any such ex ante distiction contradicts the claim that the Coase Theorem applies to any prior allocation of rights. Voluntary bargaining cannnot give rise to tort and criminal law. Quite the opposite is true: at least a basic tort law is necessary to make voluntary bargaining possible. Tort law (and the associated property law which defines boundaries for the tort of trespass) is logically prior to contract law: good contracts depend on good tort and property law. Without a good tort law already in place, nobody, including the "protection firms" posited by anarcho-capitalism, can engage in the voluntary bargains that are necessary for efficient outcomes. This is not to claim that the polar opposite of anarcho-capitalism must be true, i.e. that "the government" along the lines we are familiar with is necessary. Instead, a system of political property rights that is unbundled and decentralized is possible, and may give rise to many of the benefits (e.g. peaceful competition between jurisdictions) promised by anarcho-capitalism. But political property rights are not based on a Rothbardian assumption of voluntary agreement -- instead, in these systems the procedural law of political property rights, as well as much of substantive property rights and tort law, is prior to contract law, and their origin necessarily involves some degree of coercion. Political and legal systems have not, do not, and cannot originate solely from voluntary contract. Both traditional "social contract" justifications of the state and the Rothbardian idea that contracts can substitute for the state are false: in all cases coercion is involved, both at the origin and in the ongoing practice of legal procedure. In both cases the term "contract" is used, implying voluntary agreement, when the term "treaty", a kind of agreement often forced by coercion, would far more accurately describe the reality. The real task for libertarians and other defenders of sound economics and law is not to try to devise law from purely voluntary origins, an impossible task, but to make sure the ex ante laws make voluntary bargaining possible and discourage coercion and extortion (by any party, including political property rights holders or governments) as much as possible. Every year millions of people spend days or weeks on cruises, but Patri Friedman, Wayne Gramlich, and their fellow Seasteaders want to live on the sea full time. They want, essentially, to conduct political experiments in mobile communities as free as possible from sovereign jurisdictions. To do this, they are designing extravagant new kinds of structures that they believe will withstand the violent storms and other harsh conditions that can occur offshore. Besides tourism and jurisdictional arbitrage, there are a variety of other economic incentives to live on the ocean. Fishing and fish processing often involve employees spending many months at sea. Oil, diamonds, and soon a wide variety of other kinds of minerals are increasingly being extracted as land-based minerals are slowly depleted. Gramlich and Friedman have a very admirable goal but are trying to do too many things in parallel. They seem to have spent far more time in creating futuristic designs from scratch than in figuring out how to retrofit normal ships or mobile offshore oil platforms. On top of this is their important but novel and ambitious political experiment in lowering exit costs. While there are some relationships between the politics and the engineering, a better approach is to innovate in one area at a time. Design novel offshore technology, or design novel offshore communities, but don't try to do too much of both at once. Friedman voices a complaint, hardly uncommon in the world of engineering, that he has a hard time communicating with ocean engineers. I suspect the problem is that Friedman and Gramlich have taken their designs, whether workable or not, far away from the kinds of designs ocean engineers are used to analyzing. If they just started with normal ships and offshore platforms, then used such equipment as building blocks for larger structures, rather than trying to reinvent ocean engineering from scratch, they would not lack for experienced engineers to understand their designs and shops to assemble them. Sure, such structures seem crude and inefficient compared with the elegant and optimal structures that might be designed in theory. But they would be a far less expensive way to demonstrate the political and economic viability of seasteading. And they could be shown to offshore engineers who could quickly recognize most major problems they might have. The Friedman/Gramlich approach excites the imagination, but a far more incremental approach is needed to make it work. To take up Friedman's analogy: if all that exists are military planes, and you want to start the first civilian airline, don't try designing civilian planes and civilian airports from scratch. Just buy a bomber, yank out the bomb bays and guns, install passenger seats, get permission to use a couple military airports, take a few test flights, and start selling tickets. The first version may well fall very short of the optimal or ideal you have in mind, but it will give you the experience and the revenue needed to improve the design and approach that optimal. The biggest technological hurdle to meeting the requirements of the political experiment is probably the ability to join and separate the floating platforms at low cost. They must be moored and yet withstand the harshest storms (or alternatively to anticipate the storm, quickly unmoor, ride out the storm separately, and remoor when normalcy returns). This problem is mentioned briefly here but as far as I know, Seasteaders have not come up with a good solution for it. Mooring in rough water is a hard problem -- there are good reasons docks lie in sheltered bays. 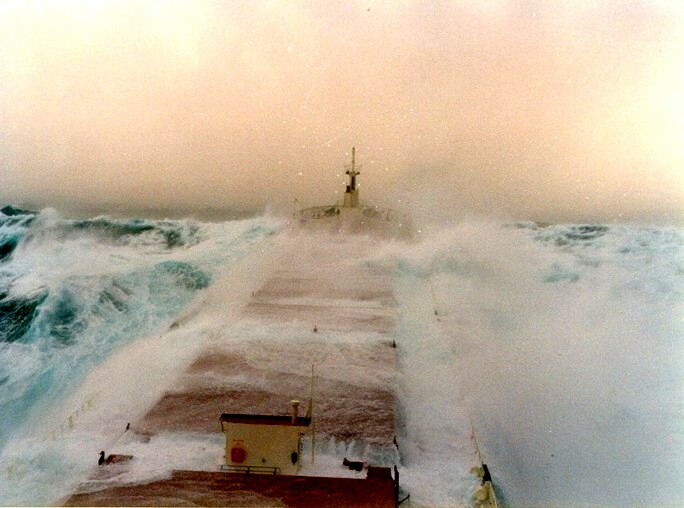 Ship-to-ship refueling, a common naval procedure, has long been very dangerous in bad weather. Ships and platforms loosely moored with cables can easily collide, smashed together by wind and wave, with devastating consequences. Friedman and Gramlich believe that their ideal platform will have "no" bobbing, lateral movement, or tilting from waves and wind. But oil platforms do exhibit enough such movements that trying to keep them moored together with traditional techniques in a storm would be highly dangerous. Cables could not prevent the platforms from colliding with high force, whereas a completely rigid mooring that coupled the movements of all the joined platforms would likely fail from strain. Some good old Internet searching digs up the fact that folks in the deep sea oil and liquified natural gas (LNG) industries have solved a similar problem -- how to offload fluids offshore, from FPSOs to tankers or from tankers to offshore pipeline terminals. For example the LNG industry needs to be able to hook up the huge LNG tankers to the offshore offloading terminals even in storms. One solution to this is the soft yoke flexible mooring. This is often abbreviated "SYMO" for "soft yoke mooring and offloading". It allows ships to moor to each other without the dangers of approaching and colliding in rough wind and water. A soft yoke flexible mooring (SYMO) for yoking ships together, even in rough waves and most storms. The design allows each ship to ride the waves separately, greatly reducing the strain on the yoke, while keeping them from approaching or dispersing. (1) Get a few dozen yacht owners to participate as volunteers. ("Yacht" here just refers to any seaworthy boat capable of mooring to other such craft and to larger platforms with SYMOs). (2) Set up a system of two or more privately owned offshore anchored moorings: tough cable moorings such as those used by large ships in the oil industry (eg FPSOs). (3) Attach a small old cruise ship or retrofitted oil platform to each anchored mooring. These should be large enough to have most of the infrastructure a small cruise ship would have, and be able to provide basic services to the yachts. (4) Yachts moor to the larger ship or platform using SYMOs. For oil platforms the SYMOs may have to be heavily modified. Yachts might also moor to each other using SYMOs, but some of the yachts should also be anchor-moored to the ocean floor, unless they don't mind the community drifting. (5) Yacht owners choose which of the two or more communities they will join. (6) The cruise ships or platforms that form the core of these communities compete to provide various services, amenities, and political systems. (7) Yacht owners can either be independently wealthy, or they can make a living by providing services to nearby fishing fleets, fish processors, offshore oil platforms, etc., or by providing temporary quarters for workers of same. (8) When a storm comes that may be too much for the small SYMOs to withstand, everybody gets on yachts and disperses until the storm blows over. These communities would look a bit like this offshore floating dock in a sheltered bay near Lund, British Columbia -- but much farther offshore, larger, more robust, and more politically independent. If you see this coming, scram. There will be big differences between these salty communities and modern towns. If the local court or zoning board or captain-of-captains won't approve improvements to your yacht, or your desire to set up a gambling house or a stinky fish processing plant, just move your house to another seastead community that will tolerate it. (I suspect fish processors will retain their own separate communities). Low exit costs bring freedom. One kind of public nuisance that these seasteads may be in special danger of running into is what I call a provocative externality, meaning that besides or instead of being ethically dubious or causing direct harm to the community, they may cause danger to fellow community members by provoking a country to attack the seastead: drug smuggling, money laundering, polygamy, being a haven for terrorists, and so on are examples of activities that could, whether rightly or wrongly, provoke attack. Since many of these activities might also be quite lucrative, the political issues of whether to ban them may cause great tensions. Vulnerability to attack by traditional countries limits the degree of substantive liberty seasteads can achieve -- they will not be able to achieve a perfectly voluntary society within even the substantive law, much less within procedural law, which I now turn to. No coercion? In these Seasteads, who does the law enforcement, and who or what gives them the right to commit law enforcement acts that are physically equivalent to torts and crimes? What distinguishes arrest from assault and battery, imprisonment from kidnapping, legal distraint of goods from theft, or a legal search from trespass? I think you will find that these societies will have to deal with the very same problems of coercion and procedure as our own governments. Calling a legal document that defines and allocates rights to commit these coercive acts a "contract" instead of a "constitution" may be the Rothbard-correct way to do things, but it doesn't actually go very far towards solving the hard problems of living together in a world where people are often coercive. It is even more important for the political and legal designs than it is for the engineering designs to take an off-the-shelf approach. Pick a country and subdivisions thereof, either a current or a well-document historical politican and legal system (for example the U.S. and a particular state, county, and town), and use its constitution, statutes, and court precedents as basic legal precedents, which can then be modified by local courts (in a common-law manner) and other local political authorities. If the U.S. is used as a model, I have suggested some basic changes to make its constitution less subject to the growth of government power. Low exit costs will also greatly help. These kinds of macro-political issues will mostly, however, be well beyond the scope of Seasteading unless or until they reach a time when they are large and mature mobile cities. The first ones will, as with cruise ships today, probably just be based on the "captain is king" model that has long dominated sea law. Friedman has even taken to calling himself "Captain Patri". Perhaps seasteads will revive the old paradigm of political property rights. I wish these projects the best of luck. It had to happen -- Unenumerated(tm) has become a Capitalist Tool(tm) -- specifically, it is now part of the Forbes.com blog network. If you are overly annoyed by the ads, would prefer to donate, or have any other general comments about Unenumerated, feel free to leave them here, or you can send them to me at nszabo AT law DOT gwu DOT edu. The scholars quoted in the original article sound like they are just engaging in a fancy form of technical analysis, which purports to capture in mathematics the psychology of the crowd, but in almost all cases turns out to be worthless numerology. The fancy math doesn't explain bubbles any better than [Robert] Schiller's simple driving analogy: there is a big event at an obscure location (let's call it Burning Man, out in the middle of the desert somewhere). People driving to the event are very uncertain of the directions. At a certain intersection, on average 60% of them correctly believe they must turn right and 40% incorrectly believe they must turn left. But they can usually reduce their uncertainty by observing the behavior of others, who are somewhat more likely to be correct than wrong, and altering their [probability estimates] accordingly. Normally this works, but on rare occasions it goes wrong: for example, if the first three cars happen to turn left, the fourth, who had believed with 60% confidence that right was the proper direction, will rationally change his mind and go left. Thus a string of bad luck can make all the cars start going off in the wrong direction, except for those handful of drivers that are strongly confident in their knowledge that one should go right. Where this analogy goes off the rails as public policy analysis is with the tacit hubris that certain academics from sufficiently elite schools are flying above the whole event in a helicopter and can direct traffic, if only their mathematical analysis is fancy enough. Rather academics and policy makers are in the traffic themselves, generally seeing information biased in ways similar to or even more extreme than the information investors see and act on. In many cases mispriced markets create arbitrage opportunities for truly knowledgeable investors, but analogs to such arbitrage opportunities, i.e. the ability to be rewarded for correcting actual misinformation, are much less prevalent in academic and political policy circles. We should thus expect political policy to be much more prone to biased political fads and herd-following than markets are. Both markets and governments may often take wrong directions, but for politics the inability to correct wrong directions may be endemic. Markets tend to correct themselves, usually in the short run and practically always in the long run, depending on the costs of arbitrage, but there is often no easy way to recognize or correct a political bubble. Thus, applying the same rational uncertainty assumptions to politics as we do to markets, if we give political decisionmakers the power to "pop" bubbles they think they recognize, they will probably tend to make genuine market bubbles worse, will prevent markets from sending genuine supply and demand signals, and will introduce other extra transaction costs. Recently I've been both daydreaming and pondering some of the problems that daydreaming can cause. I've recently learned that not only do interstellar meteors rudely hit our lovely planet, but some of them may be quite valuable, e.g. black diamond, which leading researchers believe to be the products of supernovae. The Amsterdam diamond sold in 2001 for about $52,000 per gram. The fact that multiple black diamonds have been found on earth suggests that there may be many tonnes of such diamonds flying through the solar system at any given time. By naive extrapolation one tonne of black diamond should be worth $52 billion, but common sense suggests otherwise. If somebody launched a robot to grab a tonne of black diamond out of the darkness of deep space and fling it into the sea, then cut and polished it up for auction, the resulting gem(s) would almost surely fetch only a tiny fraction of that $52 billion. This presents the interesting puzzle: what happens when a collectible, the value of which depends on its stable scarcity, (and thus, its shape of its demand curve depends in part on the shape of its supply curve), suddenly is discovered to be common? Its price might fall far faster than would be expected for a normal commodity demanded solely for its consumption. This suggests, too, that the recent rise in the use of commodities for their monetary properties may in some cases be quite fragile. Where new cheap sources or substitutions are discovered for a commodity, the price of that commodity might fall much farther and faster than if consumption alone shaped the demand curve. This may be a good argument for the gold bugs, if such a breakthrough is less likely for precious metals like gold than for other commodities. I find it a good argument for diversification across a basket or index of commodities. Either of these strategies is still vulnerable to a a return to good fiat currency policy by the U.S. Federal Reserve or the European Central Bank. Speaking of daydreaming about space, Mike Thomas well describes the utter waste NASA has made, and is still trying to make, out of our tax money and our daydreams. That NASA has talked many space fans into believing that government can successfuly plan for and design infrastructure for hypothetical future business exceeds in idiocy even the old state socialism, which showed time and again (with over a hundred million starved) that central agencies couldn't plan satisfactorily for even present industrial needs. And now for a nice exercise in pure daydreaming: SETI, the Search for Extraterrestrial Intelligence. The Drake Equation makes it all sound very scientific, but plausible inputs into the Drake Equation can make its ouptut vary by nearly twenty orders of magnitude. At one extreme there may be no civilizations in the visible universe except us. At the other extreme many SETI people believe that each galaxy may be full of millions of rather compressed and cryptic civilizations. There are plenty of people who find one extreme quite plausible and the other quite implausible, for each extreme, and plenty of plausible arguments for each side, but in fact we just don't know. SETI is an obvious example of an error that is far too common, if less obviously so, in many other areas of science: too many people who style themselves as scientists present highly uncertain opinions, based on obscure or questionable assumptions, as if they were accurate facts or settled theories. The precision and confidence of their language often far exceeds their accuracy. Modern science is so specialized that even the vast majority of fellow scientists often don't have the time to dig in to unearth the hidden assumptions behind their fellows' claims. They like us come to accept opinions, possibly of a highly uncertain nature, as facts based on the authority of the scientists. Mistaking precision for accuracy is also one of the big problems with with attempting to predict the future needs of commerce, as NASA has purported to do. As if exagerated claims to accuracy and the hiding of assumptions weren't bad enough, due to the dominance of one kind of funding, namely government funding, most of the scientists in some fields share common biases, especially political biases to justify expanded government budgets. Authority increasingly takes the form of political power, funding increasingly requires political power, and political power, rather than facts, has been increasingly the source of "scientific consensus." Here is more on the the trouble with modern science.